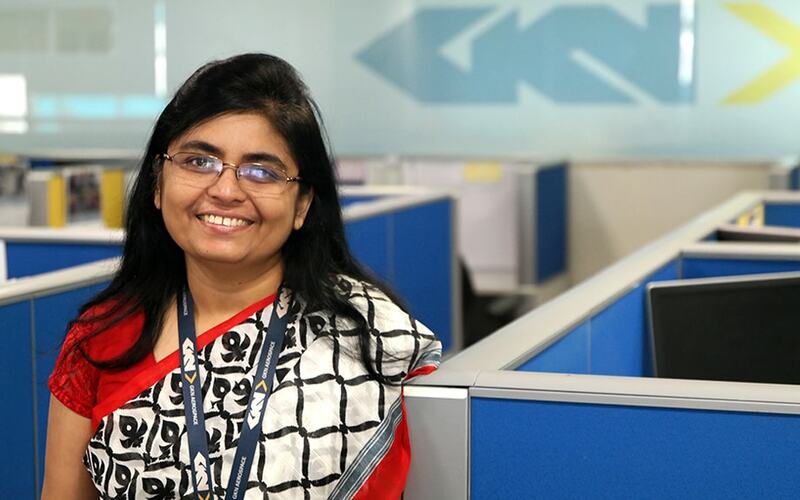 Asha Koshy joined GKN Aerospace’s Bangalore office in India (GAI) in 2010 as a Computer-Aided Engineering (CAE) analysis lead. During the past seven years she has held a number of different roles and is now Systems Engineering and Support Manager. Asha’s natural interest in mathematics and an analytical mind, along with inspiration from her dad during her childhood, are the main triggers for Asha’s interest in engineering. “As a kid I used to watch my dad with his own tool sets, building and fixing things up that inspired me to explore, dismantle and assemble things on my own”. When Asha stepped into the world of engineering, she soon realised it was more male dominated and to compete with her male colleagues, to stay at par with them and to move along with them was a great challenge, especially in Indian culture. Asha was the only female in her class at university and the same trend followed when she joined GE Aviation in her first job. The initial days were hard, but they also shaped Asha’s career and turned out to be experiences that teach her to cope, win and grow. “Now when I look back, I know it was worth all the effort”. “Pursue your heart’s desires. Be it a small task or big, take one step at a time; compete with yourself and not with others. You are sure to face obstacles. Keep moving forward, sometimes slow, sometimes fast, but never quit. I believe opportunity will come knocking your way.” This is Asha’s advice to everyone.